Home » Blogs » Charles Gaba's blog » I wonder if NewsBusters still thinks I'm a left-wing shill for the HHS Dept.? Meet Charles Gaba: He’s not a professional statistician, heath-care expert or political operative. He’s a self-described “numbers geek” who just wants to know how the new health-care law is doing. Yes, that's right: NewsBusters (which is sort of a Poor Man's Breitbart) wrote an entire hit piece on me a year and a half ago, trying to make hay out of their "exposé" that: I'm actually (gasp!) a partisan, activist Democrat!! Yes, I know; take a moment to collect yourselves. I'm sure this is as shocking to you as it was to them. While people will face stiffer penalties for failing to buy health insurance, significantpremium increases in many states mean they will likely end up paying a lot even if they do comply with the mandate. Some people may be able to minimize their increase by shopping around, but one report estimates a national weighted average premium increase around 13 percent, with some states like Minnesota seeing increases higher than 41 percent. Yes, that's right: The "one report" they're referring to is me. Yes, that would be Michael Cannon, aka the lead architect of the King v. Burwell case, testifying before the Republican-controlled Senate Committee on Small Business, headed by Republican Senator (and currently-in-very-deep-hot-water) "Diaper" Dave Vitter. I'm pretty sure this is the first time that official U.S. Senate Committee testimony has included a reference to an article with the phrase "screw your base" in the title. So, there's that. 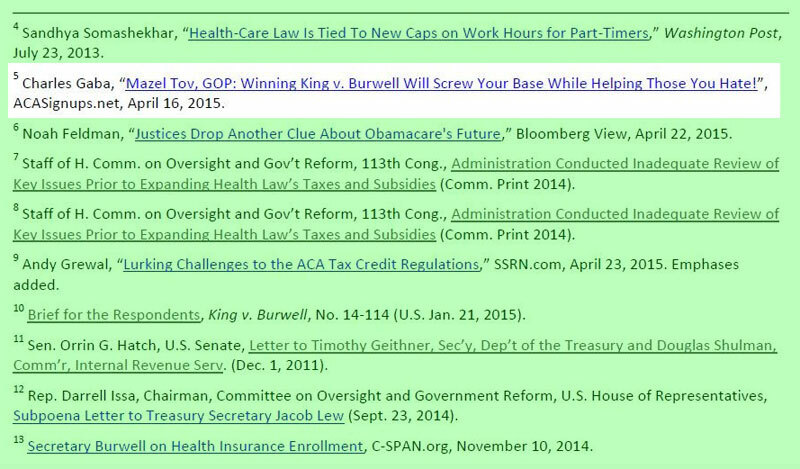 Anyway, I guess I should be flattered that the CATO Institute thinks I'm such a Reliable Authority on the Affordable Care Act, but doesn't that kind of mess with NewsBusters' "Democratic Shill!!" meme? Gee, could it be possible that although I'm very openly a left-leaning, progressive Democrat who favors Single Payer healthcare, I'm also able to separate that out from my data analysis when it comes to reporting on the Affordable Care Act? Is it possible that I like to acknowledge fact-based evidence when I crunch my numbers, even if that evidence isn't always flattering to my ideological leanings?